Middle Fork of the Rogue. Photo by Hunter Connolly. My morning started off with a quick email check and confirmation from the Mt Ashland Ski Patrol director that the mountain would be open. They got about a foot on Saturday and it snowed all Sunday night. On the drive to the mountain, I received a call that the mountain was closed and the lifts would not run due to high wind. I had to quickly scrabble for a different plan to not let the day slip away. I sent out some text messages and got a reply from Hunter Connelly that said “945 shady cove sf”. I read it twice and cold not decipher it. Was it an address? I quickly called and it meant to meet at 9:45 at Shady Cove the plan was to do the South Fork of the Rogue. This barely gave me enough time drive to my house and swap out my ski gear for paddling gear and make the arrangement point on time. I met Hunter and Jared Sandeen and we started driving up to the put-in. We decided to check the Middle Fork gage on the way up since they are both close, share the same takeout and you drive by the Middle to get to the South Fork. When we got to the Middle, we all got out and looked at the gage and the flow. It was one of those all day rains that was mixed with cold and chilly air. Hunter and Jared had both done the South Fork and the Middle Fork but I had not done either. We looked at the gage, then at the flow and stood around discussing, the flow. I was getting soaked and had no idea what either meant so I quickly got back in the car. The gage showed about 2.4-2.6. We then drove to the South Fork and repeated looking at the flow. We looked over the upstream side of the bridge at the rock in the center. There was water flowing over it which meant high. The consensus was that both were higher than either had done them before. The big question was how much higher and how did that translate downstream. Was this still a manageable flow? I was getting soaked again and quickly jumped back in the car. I left the decision up to them since I had never done either. They came back to the car and said “Middle Fork” so we drove back to the put-in. While there, I was losing my stoke. I was partially wet from standing in the rain and starting to get cold. I waited till the others got dressed and was the last out of the vehicle. I tried to catch my second stoke as we put on. In the first couple miles we had 3-4 tree portages. It was flat water but the portages were no easy task. It was the choice of stay close to the shore and deal with mud and collapsing soil or go up into the woods and try to poke a hole through the underbrush. Different techniques were used with varying success. The good news was this was the last of the trees. After passing the trees, we were floating down, and all of a sudden there was this enormous water fall coming in on the right. It was a 20 footer dropping over a 40 footer, etc.. Basically falling from the sky. It was then trying to push itself through the trees to join the Middle Fork. It looked like the trees were squirting out water. So beautiful yet so drastically changed the nature of the river. It felt like the river doubled in flow. Not truly that much but it gave it that feel. We soon got down to the first major rapid. Because the flow was high we had to be super careful about eddy space and not crowding. Jared hoped out to scout and quickly gave me the hand signal “1,2,3”. Which translated to left, middle, right. I followed Hunter through and it was fun but you could tell with this flow there was some spice to the run. At the next spot I got out and took a look. The bottom had a pointed rock in the bottom. From the top, it looked like you could go left or right of the pointed rock. After describing it to Jared, he said, memory told him the bottom left was the better route. He went first and then Hunter. 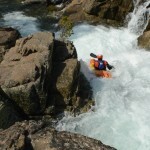 By the time I got into my boat, and fired off the drop, I came into a small eddy on river right at the bottom. Jared was out of his boat and quickly gave us directions on the next rapid. I was in the eddy and could see that there was a small seam to cross then a big horizon line. Jared said to go off the left side of the hump and then hit the lower flowing charging hard back to the right. As I started taking paddle strokes out of the eddy, I realized how with this style of boating how strong the trust level needs to be with your paddling partners. I was trusting Jared that he could assess the drop, my abilities, and his abilities to describe where to go. If he thought any of those were a “no go”, he would signal to me that I needed to look for myself. I have boated in these situations with him often. As I pulled out of the eddy I felt that even though I could no see over that horizon that I trusted him. Just as he described, as I came off the boof charging to the right the current carried me down and into the eddy on the right. This would turn out to be the steepest single drop on the run. A little farther down, Jared knew that there was a hard rapid that let straight into the portage rapid. The portage rapid is right before entering the canyon. Hence stacked up issues if someone got in trouble. We all got out to scout this drop just to visually see where we wanted to be while in our boat and if things did not go as planned, and where to swim too. There was a large eddy to the right before the portage which gave us all relief. I went first and had probably my best line of an single rapid on the run. Right where I wanted to be. Jared came next and got shoved to the right, mostly because he was in such a small boat but better right than left. Hunter was taking pictures and I got out with a rope while he went up and aced the drop. The Portage rapid was heinous looking. The water gets tight against the left wall then drops off this 10-15 foot drop onto this jumble of rocks. Today there was enough water to cover up the jumble of rocks but the jumble of rocks then formed this massive pour over that created a beat down waiting to happen. We ate a snack and basked in our surroundings. Even thought it was pouring rain, at this point, it really did not matter. I felt like I was in Shangri-La. A magical place that not many could experience. At this point, this is where you enter the gorge. 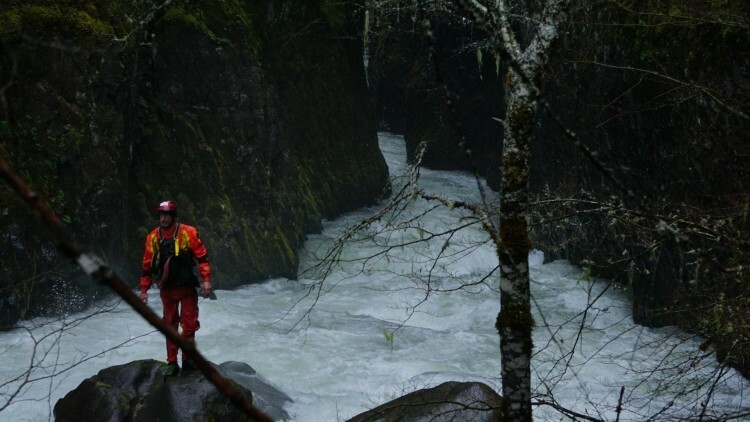 The gorge is like Takelma on the North Fork of the Rogue but way higher. There are two hard rapids below this point. One is the confluence where the South Fork of the Rogue and the Middle Fork come together and then one below. 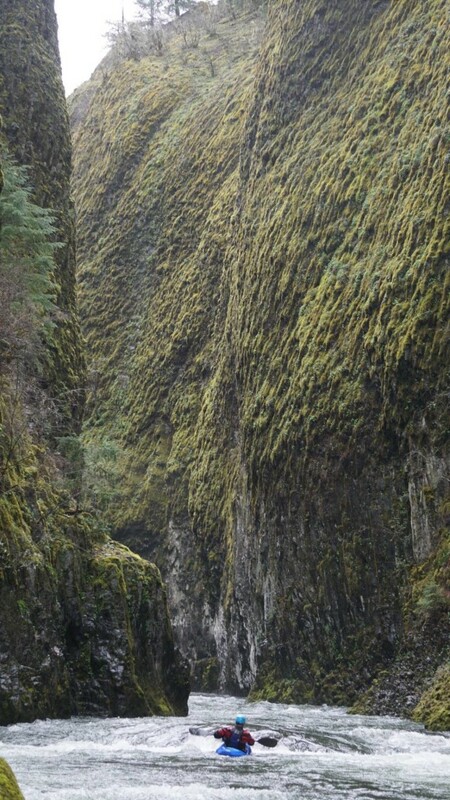 The Middle Fork Rogue gorge. Photo by Hunter Connolly. We started into the Gorge. Jared went first and I went second. I then caught a eddy and waited for Hunter. It was not hard, entering the gorge but something bad here could spell major disaster, so our senses were heightened. I caught a super small eddy and held onto the wall and waited. Hunter came down and passed me. Jared was out of his boat on river left scouting the confluence rapid as best he could from his vantage point. Hunter was river right below me and I was facing upstream holding on to the rock wall. Jared gave us directions but because of my location, I could no turn around or even look over my shoulder. I asked Hunter if there was room for me in his eddy and he said to stay put. After the verbal, Hunter said he was going. I wanted to follow fairly close since I was at a disadvantage from my blind location. The line, was to stay left through some rocks, back to the middle, then at the confluence stay way left and then come back to the right as you come off the main drop. I see Hunter go through the first squeeze and he gets backendered some and has to give a big right brace to stay upright. Jared is standing there and as I pass, he yells, “farther left”. I oblige as best I can and have to brace hard also but grateful for not backendering. I then move out to the middle and see the confluence coming. I look up and see that Hunter has caught an eddy on left, I glance up stream of the South Fork and see a water fall and a bunch of water coming down. I glance downstream and see the line forming. I have less than a split second to decide to try to catch the eddy Hunter is in, or keep going and run the drop. My eyes are locked on the route and I just keep going with the flow. The drop is big and water was powerful having seemed like flow just doubled again!! I had a great line and hollered at the upstream crowd to let them know I made it through. I then eddied out and waited for them to come through with big smiles on their faces. Comments were made how South Fork seemed stout and if we would have chosen that option it would have been big. The next section was mellow for while and once again we soaked up the gorge and the special place we were in. The last drop we all got out of our boats and looked. It had a big hole at the bottom and two possible lines, left where you ride a curler off a rock then off the wall or right where there was a sloped hole. The bad part was the middle of the hole and left or right there was potential to get into the hole but looked passable. We talked about this rapid extensively and about the best way to set safety. One suggestion was a rope but you would have to hold onto the wall and when thrown to the swimmer, he could pull the person off the rock since there was no where to anchor in. Also the thrower would just be pulling the swimmer back into the hole. We discussed all three running it at the same time and hoping for the best. Finally we decided that two of us would run right and the third would wait. The option was that if the first two had issue, the third could try the left line. Sometimes you just have to go with the best option even though it may not be the option that you want. After all that discussion Hunter went first and cleaned the right line, I went next and never got my face wet. Jared also cleaned it. After all that discussion it looked worse than it was. At this point the gorge fades away and it is a couple of fun miles to Lost Creek Lake. While paddling down, we found a Werner paddle in some backed up logs. Jared said, he knew the owner and was with him a few years ago when he lost it. We took turns paddling the lost paddle out. We shortly came to the North Fork Rogue confluence and paddled the short distance up to begin the hike up. We all sat in our boats at the takeout. Discussing, laughing and reminiscing about the day, letting the adrenaline run from us before starting the upward hike to the vehicle. The Middle Fork is one of the more unique runs I have done. I can’t wait to see the South Fork.